Anyway, in this event the winds were light and the first boats got off to a very slow start. We milled around and started about 10 minutes after the last boat (Cat Sass -32 rated cat) using our J1. At Huckleberry we launched our A1 kite and ran our polar numbers north. 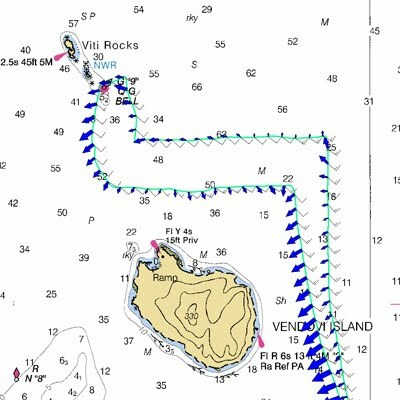 Winds were light, but thanks to good instrumentation we chose the correct lines and managed to start passing boats by Vendovi Island much to their surprise! On the north side of Vendovi there was a parking lot where most of the boats were drifting around. We jibed over and sailed through the fleet (horsepower & mast height really helped here) and jibed again on the lay line for the mark. We had a good drop, hoisted our new J2 and tacked around the mark while avoiding the rocks immediately to the north. The J2 was a little heavy to start with, but it looked like the wind would be building so we stuck with it. As it turned out the winds reached nearly 20 knots on the beat home, so it was the right sail after all. On the way back we threw in a reef to reduce power and had a nice sail home. At the end, the only boat we could see was Cat Sass with the rest of the fleet being a long way behind. Our elapsed time was 2:05:35 at an average speed of 7.45 nm/hr. Being a pursuit race and that we finished first we earned another bullet!